Now you have the opportunity to learn from the comfort of your own home, on your own time and at your pace! L.E.A.N. Online includes six interactive eLearning segments, hands-on learning activities, family challenge activities, free downloads, and more! The L.E.A.N. Start Online course includes six interactive eLearning segments. 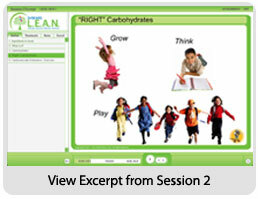 Each segment includes recorded narration, script, colorful graphics, interactive quizzes and activities and more! Each eLearning segment is approximately one hour long and can be viewed as many times as you would like during the duration of your training. Click Here to view a sample eLearning segment. Download and print each session’s worksheet to fill out while you are completing each eLearning session. Each worksheet will help you capture the most important concepts, jot down notes, and include a snack recipe to try for the week. Each of the six sessions include an activity to get the entire family involved and put what you are learning into practice. Activities range from scavenger hunts to ideas to increase physical activity on a daily basis and have downloadable instructions.